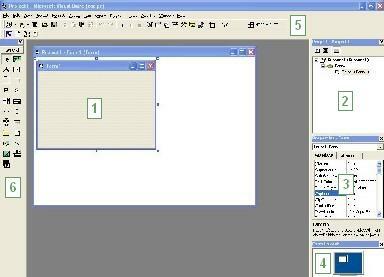 When you start up Visual Basic you will be presented with a screen similar to below. The main parts of the environment have been labelled. 1. The default form which is created on startup. You can change its size by dragging the small squares which appear around it on its edges and corners. You can change its name and other properties in the Properties window (3) which is discussed below. 2. File list - this allows you to view all of the files (forms, modules etc...) associated with your current project. 3. Properties window - each form and each object/control on a form has properties which are displayed in this window. Some examples of these properties are Font, Visible, Enabled, Width and Height. Different objects have different properties as not all properties are relevant to some objects. 4. Form layout - here you can specify where the form appears on the screen. 5. Menu and toolbars - similar to any Microsoft package. 6. Controls toolbar - contains all of the controls you can use on a form. To insert a control on a form, click on a control on the toolbar, then drag a rectangle on the form in the main window.